A collaborative project to create author articles for under-represented literary authors in Wikipedia. I designed this assignment with Sarah Einstein and helped implement it in her Creative Nonfiction course, taught at Ohio University in Fall 2014. Students working on this project created Wikipedia articles on the creative nonfiction authors, such as Wendy C. Ortiz, they were reading and studying. I also wrote a 2-part blog series devoted to the project at the Digital Rhetoric Collaborative. 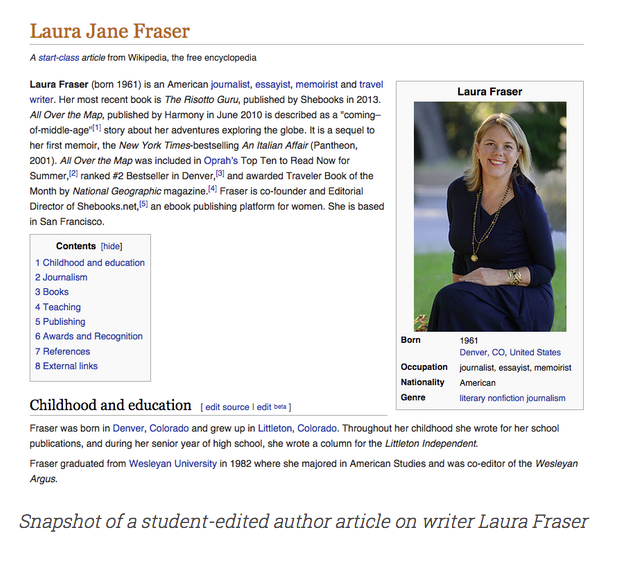 “Literary Citizenship in Wikipedia, Part 2? Digital Rhetoric Collaborative. University of Michigan Press/University of Michigan Center for Writing. December 3, 2014. “Wiki Wednesday Kicks Off DigiWriMo: Literary Citizenship in Wikipedia” Digital Rhetoric Collaborative. University of Michigan Press/University of Michigan Center for Writing. November 5, 2014.